A selection of Nannini frames created and styled in Grilamid TR90. This high quality material is shock-resistant, non deformable and hypoallergenic. 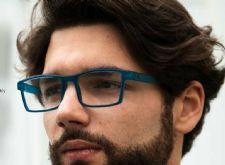 Available to two styles a square shaped thin frame the Nannini OB Range, or a more shapely flowing design we call Chic. Both frame styles are supplied with demo lenses and cutting patterns to allow you to take them to your optician and have your lens of choice fitted by them to your prescription. Most importantly at a price that makes buying a new pair of glasses affordable again.